Mumbai: US President Barack Obama yesterday visited Mani Bhavan, once the residence of Mahatma Gandhi, and hailed him as a hero not just to India but to the world. An ardent admirer of Gandhi, Obama wrote in the visitor's book, "I am filled with hope and inspiration as I have the privilege to view this testament to Gandhi's life. He is a hero not just to India but to the world." His wife, Michelle, too, wrote that she would always treasure this visit. "The life and teachings of Gandhi must be shared with our children around the world." The high-profile visitors went through Mani Bhavan, where Gandhi stayed from 1917 to 1934 during the struggle for independence, and were impressed by the Mahatma's simplicity. The room on the second floor of the heritage building on Laburnum Road has been preserved in its near original setting. Obama also went to the adjoining rooms where Gandhi's life is depicted through a tableaux and photo gallery. Obama also placed a garland of hand spun cotton around a bust of Gandhi. The American president has often said Gandhi has inspired Americans and African Americans, including Dr Martin Luther King. During a school interaction in the US, Obama had said once that if it were possible, he would have loved to have dinner with Mahatma Gandhi. On seeing Dr King's signature in one of the guest books, Obama remarked: "Pretty cool. 1959. What a great book." Tushar Gandhi, great grandson of Gandhi, said: "Obama's visit to Mani Bhavan is a ‘thanksgiving' for his predecessors, Martin Luther King and his son. Gandhi's vibrations have obviously recharged the batteries of his predecessors to fight for justice. Now Obama's visit is a symbol of that fight for justice." Within an hour of disembarking from Air Force One after landing at 12.48pm, Obama and Michelle reached the Taj hotel, one of the main targets of the terrorists. From the airport, they first boarded a Marine helicopter and then continued in a Cadillac. The Obamas are staying at the hotel as a sign of solidarity. They placed a white rose at the memorial to the victims of the Mumbai carnage — a stone wall carved with the names of the dead and a tree sculpture. 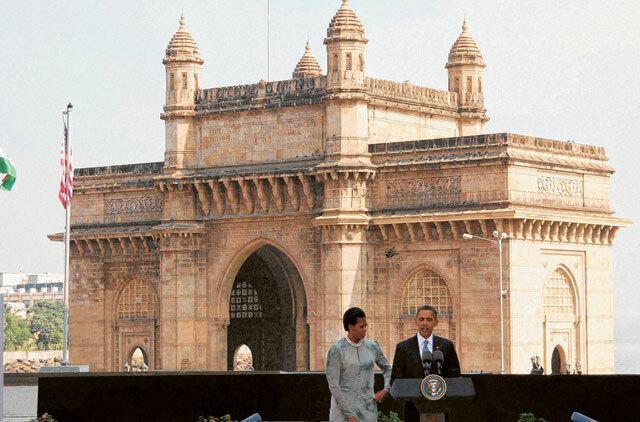 Obama chose two of Mumbai's most iconic places to begin his maiden visit to India as US president on Saturday — the Taj Mahal Palace hotel and the former home of Mahatma Gandhi. Both are more than just bricks and mortar to Indians. They also symbolise the wealth and aspirations of a confident nation and the hard won fight for freedom from British rule. Obama recognised that the Taj now has another place in the Indian psyche after writing in the book of condolences at the memorial to the 31 people who died when heavily-armed gunmen stormed the hotel on November 26, 2008. The Taj has become a symbol of the "strength and the resilience of the Indian people" because of the attacks, he said later in a speech, pledging continued support for the country in the fight against terror. Meanwhile, US officials received at least five warnings that an American man who became a key figure in the 2008 Mumbai attacks was training or working with Pakistani extremists, The Washington Post said yesterday. Despite the warnings to US intelligence agencies building up over seven years, officials did not move to question David Coleman Headley or place him on any watchlist, the report said, citing a review underway for US Director of National Intelligence (DNI) James Clapper. The report was co-published by the Post and ProPublica, an investigative journalism group that reported the story. Obama will go to New Delhi today and leave for Indonesia Tuesday after two event-packed days in the Indian capital, including meetings with Indian leaders on subjects ranging from the economy to the war on terror in Afghanistan. He will also visit South Korea and Japan.